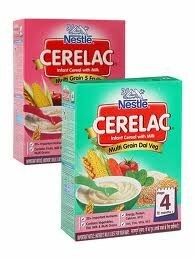 Cerelac is a brand of instant cereal made by Nestlé. The cereal is promoted for infants 6 months and older as a supplement to breast milk when it is no longer the sole item in an infant's diet. It is currently sold worldwide to Belgium, Denmark, Germany, Spain, Portugal, South America, Central America, North America, India, the Middle East, Nigeria, North Africa, Pakistan, Philippines, South Africa, South East Asia, and Zimbabwe.